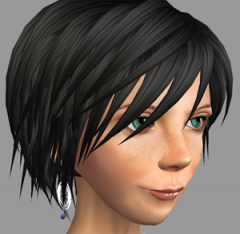 This article explains how to control your point of view in the 3D Second Life world. By using your keyboard and mouse to control the camera, you can view nearly any object or avatar from any angle or distance. Alt + Left mouse button: Press and hold to zoom your view in when you move the mouse up or down. Orbits your view around the focal point when you move the mouse left or right. Ctrl + Alt + Left mouse button: Press and hold to orbit your view around the focal point when you move the mouse in any direction. Ctrl + Alt + Shift + Left mouse button: Press and hold to pan your view parallel to the plane of your screen. Mouse scroll wheel: Zooms in or out. Escape key: Resets your view to its default location behind your avatar. Moving your avatar also resets your view. Access onscreen camera controls by clicking the View button on the bottom bar of the Viewer. For additional information about these controls, click the ? button at the top of the window where they appear. Mouselook sets the camera to a first-person perspective, allowing you to view the world through your avatar's eyes. You can enter mouselook by pressing the M key or by using your mouse's scroll wheel to zoom all the way in on your avatar. When in mouselook, your avatar turns to face the direction in which you are looking, which allows you to steer with your mouse while you walk or fly. Mouselook is also often used in order to aim or activate scripted objects. Tip: Should you ever find yourself navigating a tight space, entering mouselook can help you get your bearings. You can orbit your view around your avatar by clicking anywhere on your avatar and holding the Left mouse button. As you turn your view left or right, your avatar turns to face the same direction as the camera, allowingyou to steer your avatar. Disable Camera Constraints increases the distance you can zoom. Limit Select Distance allows you to right-click on faraway objects to find their owners. Select Me > Preferences > Advanced. Select the Show Advanced Menu checkbox. The Advanced menu now appears at the top of your Viewer window. From the Advanced dropdown, uncheck Limit Select Distance (this is on by default). In the same menu, choose Disable Camera Constraints. Click the Alt button, left-click your target, and zoom in using the scroll wheel. Right-click any object you see and select Edit > General to find its Creator and Owner.